I thought I would take some of my own advice and use some potatoes and parsnips for a good brunch dish. I also planned this dish for New Year’s day so it needed to be fairly easy and also have some hangover curing abilities if you get my drift. I came up with these parsnip and potato hash browns. While these little fried pancakes of love all look the same, they are actually all different. 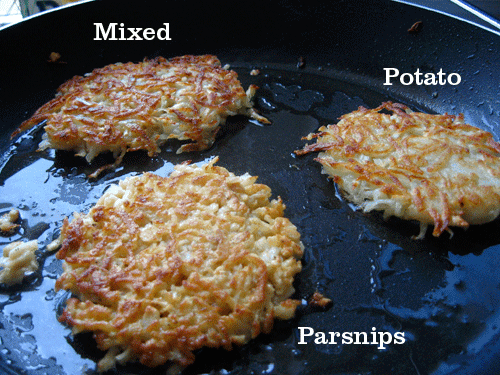 I wasn’t quite sure how parsnips would work in a hash brown form so I made a few different versions: one with just potato (my control), one with half potato and half parsnips, and one with all parsnips. I loved the parsnip versions. In fact, I think I liked it more than the all potato version. And that is saying something because I really like potato hash browns. The parsnips add an interesting flavor that works really well. Simple parsnip and potato hash browns are an exciting change from the standard without much extra work. 1) Grate potatoes and parsnips (peeled) onto a few paper towels or a clean dish towel to get out as much liquid as possible. Season the roots with a pinch of salt as they drain. You can actually squeeze them in the towel to help remove liquid. 2) Mix together potatoes and parsnips and stir in egg and flour. 3) Add olive oil to a pan over medium heat. Once the oil is hot put a disk of hash browns in the pan. If it sizzles then you did it right. Use a spatula to flatten it down. 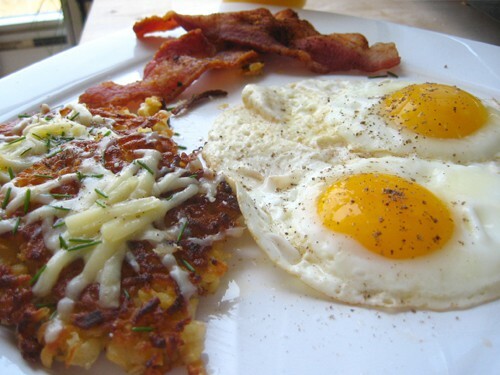 4) Cook hash browns for for 5-6 minutes on one side. It might take less time to get a good brown crispness if your pan is too hot. Also, you might want to turn your hash browns 180 degrees halfway through because the center of your pan is most likely hotter than the outside. 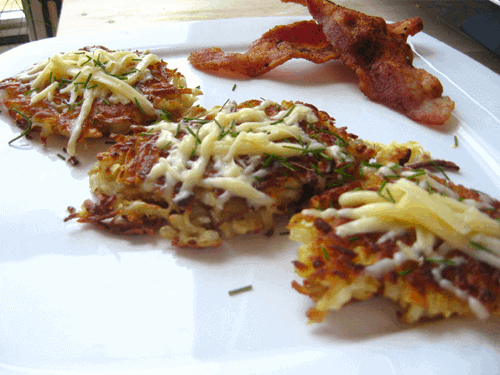 5) Flip the hash browns and cook for a few minutes on the second side until they are very crispy. 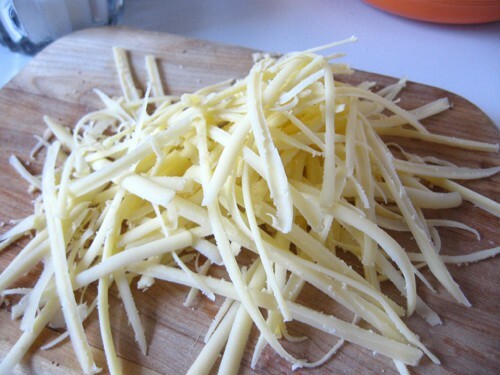 6) Top with a small amount of grated cheese if you’re using it. Serve garnished with chives and with eggs and bacon. There is lots of grating for these guys. There is one important step here. 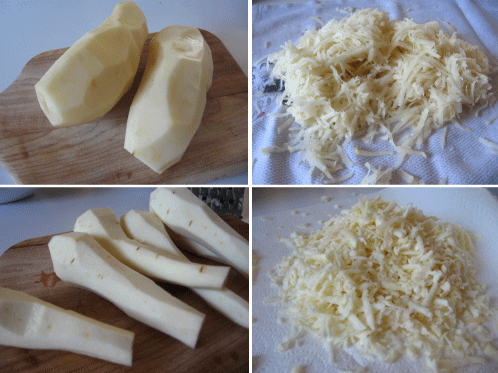 Be sure to grate your potatoes and parsnips on either paper towels or, even better, a clean dish towel. Turns out that both of these root vegetables give off a lot of liquid when you grate them and you want to get rid of most of that liquid before you fry them or you will end up with soggy hash browns. I grate mine onto a dish towel, salt them a bit which will help them release liquid, pull all of the corners together in the towel and let it rest for 5 or 10 minutes. Then wring the crap out of it. Don’t worry about being gentle. You can’t break potatoes. I was able to get over a cup of liquid from just two potatoes. Oh. If your potatoes change color a bit don’t freak out. They are just oxidizing. They will still taste like potatoes. 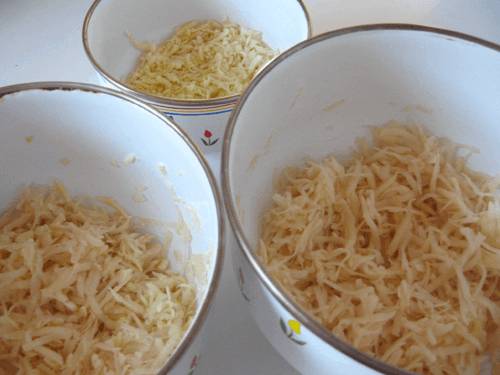 Grated parsnips look like mozzarella cheese. Because I was making different versions, I had to keep my parsnips and my potatoes together. Obviously you don’t have to do this if you are just making one version. This is where you want to add your egg and your flour. I had to split up the egg and flour in all three bowls. Again, if you are just doing one version then this is super easy. A few ounces of good cheese goes a long way. Now for the hot part. Put your olive oil in a pan over medium heat. 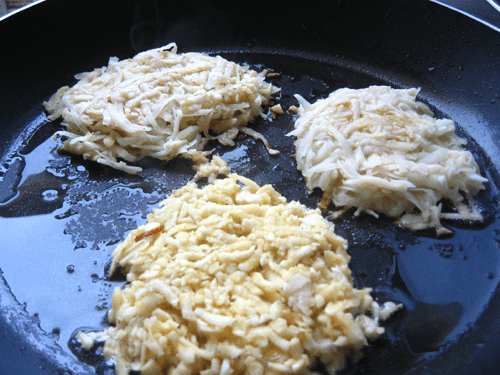 Once the oil is hot put a disk of hash browns in the pan. If it sizzles then you did it right. Use a spatula to flatten it down. The all parsnip version on the bottom is pretty fragile. Let these guys cook for 5-6 minutes on one side. It might take less time to get a good brown crispness if your pan is too hot. Also, you might want to turn your hash browns 180 degrees halfway through because the center of your pan is most likely hotter than the outside. Then give them a flip. They should be pretty sturdy at this point. I knew when I took this photo that these would be delicious. 5 minutes on the other side and they should be done. Feel free to cook longer if you want them super-crispy. I will say that I had to be gentle with the all parsnips version. Parsnips have a texture like carrots and they do not have the starch of potatoes so it was a much more delicate cake. Still worked okay though. I ate mine with some bacon and two eggs sunny-side up. How hash browns should be eaten. With bacon and eggs. 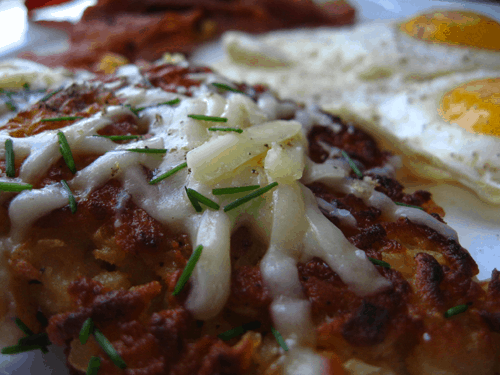 Just for good measure, here is a close-up of the crispy hash browns. A close up shot for good measure. I must say that the parsnip addition worked better than I thought it was going to. When I set out to make these guys, I thought it might be a recipe disaster, but it worked out fantastically. If I had to pick one version I would go with the half and half version. Easy to handle but plenty of parsnip flavor. I usually try to post a brunch/breakfast dish on Saturdays. If you like these posts you might want to get Macheesmo via RSS or e-mail. I LOVE hash browns. 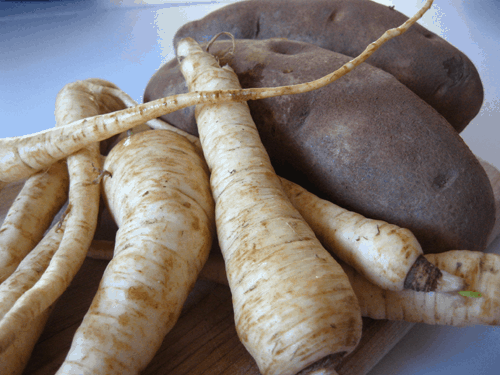 I think the parsnip variation is a great idea, but I’m curious: did they come out bitter as parsnips can often be? Personally, I like parsnips, but I know they don’t suit everyone’s tastes. Thanks for the tip about getting rid of the moisture from the potatoes–I don’t usually do this, but I’ll definitely try it next time. What a delicious-looking brekkie! Off to find some parsnips. wow! the step-by-step instructions with pics are great. love how you did 3 versions. Hi there Greetings from Australia.